"The School Committee in each city and town and each regional school district shall have the power to select and to terminate the Superintendent; shall review and approve budgets for public education in the district, and shall establish educational goals and policies for the schools in the district, consistent with the requirements of law and state-wide goals and standards established by the Board of Education." The Newton School Committee consists of nine voting members: one person is elected (citywide) from each of Newton's eight wards, and the Mayor serves as an ex-officio member. 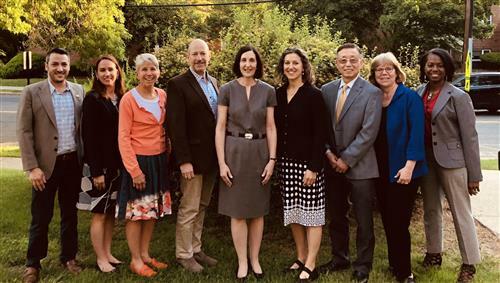 Click here to learn more about our Newton School Committee members. School Committee members and the Superintendent will be visiting all 22 schools to share information and gather feedback on key district initiatives. Meeting dates and details are sent via PTO newsletters. Email messages sent to schoolcommittee@newton.k12.ma.us will be forwarded to the entire School Committee. Please include your email address in the body or signature line of your message. To contact specific members visit our Contact Us section. 100 Walnut Street, Newton MA 02460. Telephone messages can be taken at 617-559-6110.